November 2013: Another huge Thank You to Greythounds of Texas for sponsoring Bizzy by paying for the majority of his medical expenses! 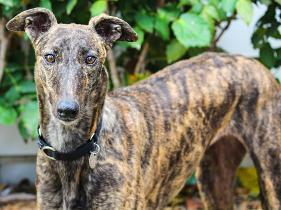 August 2013: A huge Thank You to Greythounds of Texas for sponsoring Charger by covering his neuter and vaccination medical expenses! A Special Thank You to these Grant Foundations! "In Honor of" and "In Memory of" those special to you! August 8, 2015: In Honor of Abbie & Lisa's wedding, James and Marjy LaGesse. July 26, 2015: In Honor of Abbie & Lisa's wedding, Aaron and Sara Cox. December 20, 2012: In Honor of Sissy, Sandra Parks. December 14, 2012: In Honor of Lindsay Brotherson, Sharon Bruley. October 27, 2012: In Honor of all Greyhounds, Kris Schuster. 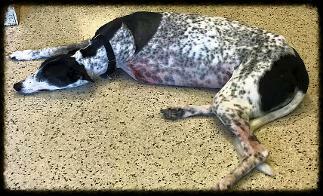 October 27, 2012: In Honor of Max (formerly Manner), Lewis and Hope Hunter. October 27, 2012: In Honor of Trinity and Miley, Dan and Michelle Reinheimer. July 4, 2012: In Honor of Strider and Cricket (Kylie) from new parents, Ian and Sara Call. June 12, 2012: In Honor of Doris Bentley from her friends, Ken and Gail Bond. December 20, 2011: Kris Schuster in Honor of Sophie, Hershey, Gigi and Tessa. December 17, 2011: Sandra Parks in Honor of Peace on Earth – Sissy & Buddy. December 11, 2011: Dan and Michelle Reinheimer in Honor of Trinity and all the Greyhounds. December 11, 2011: Sam and Deann Haggard in Honor of Guinness and the Greyhounds. December 11, 2011: Sally Rembert in Honor of all the Greyhounds. December 8, 2011: Bill and Margot Bryant in Honor of Suzanne Griggs. August 20, 2011: Dan and Michelle Reinheimer in Honor of Trinity (was Gidget). June 28, 2011: Ken and Gail Bond ~ In Honor of the wedding of Joseph Charles Krystofik and Arian Teague. December 13, 2010: Sandra Parks ~ In Honor of Bo and Sissy. May 14, 2010: Claire Pulfer ~ in Honor of Finn. April 1, 2010: Jon Bernard-Schuartz ~ In Honor of Maggie and Dixie. February, 25, 2013: Suzanne Griggs ~ In Memory of all the Greyhounds lost by Sarah and Barb Bray. Hopefully 2013 will be a better year. December 20, 2012: Sandra Parks ~ In Memory of Bo. October 20, 2012: Lucky Dog Barkery ~ In Memory of Richard Slusher (Kris Schuster's step father). June 12, 2012: Ken and Gail Bond ~ In Memory of Doris Bentley. March 12, 2012: Kathy Henry ~ In Memory of her sweet Bailey. October 24, 2010: Kim Smith ~ In Memory of Zander. July 12, 2010: Suzanne Griggs ~ In Memory of Carol Sahlfeld's Greyhound, Lindsay. June 8, 2010: Suzanne Griggs ~ In Memory of Melisa Cody's Greyhound, Rosie. March 8, 2010: Suzanne Griggs ~ In Memory of Judy, honorary Greyhound and proud Basset. March 1, 2010: Suzanne Griggs ~ In Memory of Teri Markles' mother, Pat. November 25, 2009: Carol Sahlfeld ~ In Memory of beloved Lance.